Hello dear friends I hope that your Christmas was joyous and full of family and friends. 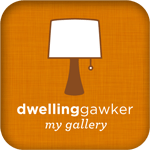 I am taking down Christmas and getting ready for the new year when my yearly report from WordPress came in and I want to share it with you. These are the results of my first 9 months of blogging results. Kind of like having a baby. LOL Thank you dear readers! A San Francisco cable car holds 60 people. This blog was viewed about 3,500 times in 2014. If it were a cable car, it would take about 58 trips to carry that many people. I love it when you leave comments, let me know what you would like to see more of. Thanx to all my dear friends that have helped me along the way! Yummy Orange Rolls for Thanksgiving! I hope that everyone had a great weekend. 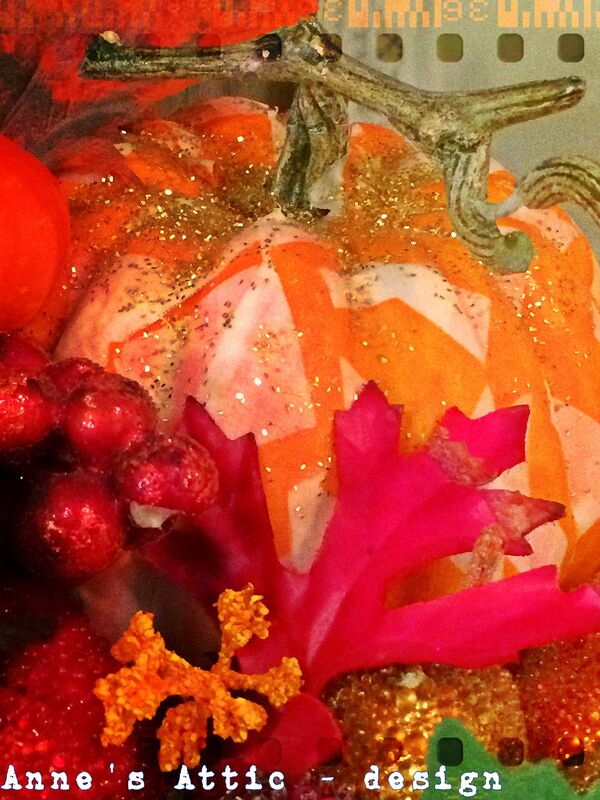 I have been browsing Pintrest this weekend and looking at many yummy, tempting recipes for a Thanksgiving feast. I was reminded of many of the great family dinners in the past and the dishes that were prepared by family members. I think my very favorite was the orange rolls that my Grandma Peters use to make. I have carried out this tradition with my family, they adore them. I love to bake and for me baking these beautiful rolls is a joy. They have such a beautiful texture and lovely taste to them. I figure if this roll recipe came over from Denmark and used for years in my Grandmothers family it has stood the taste of time or I should say the test of time. LOL I will be making a double batch on Wednesday. I don’t have a picture to show you but I want to share this great family recipe with you before Thanksgiving. Set aside for five minutes. Mix all ingredients in a large bowl well. Do not knead anymore than you have to. The dough will be sticky. Let raise in the bowl until double in bulk. When the dough has risen divide in half. Roll out dough like you are making cinnamon rolls. (Use as little flour as possible in kneading and rolling out this will make it fluffier). Mix together in a small mixing bowl. Spread 1/2 of the orange mixture on the rolled out dough. Roll up the dough tightly (like a jelly roll). Place in greased muffin pan. (You can use cookie sheets to). Let rise until double in bulk. Do the same to the other half of dough. I don’t usually make all of the rolls with the orange center, some of my family likes them without. Bake at 375 until brown. (This was my Grandma’s way of saying to keep an eye on them). It depends on the oven so watch them. After they are baked I brush a little butter over the top. Or you can make a lite frosting to go on top with powered sugar and the orange that is left over. Make it really thin and spread it lightly. I use this roll recipe for my cinnamon rolls to. I use it with many different shapes. Like crescents, Parker House . . . Enjoy this lovely recipe,I assure you will be getting a lot of smiles when you do! Life is LOVERLY when you are doing what you enjoy! Thanx to all my dear friends! So sorry that I have not posted for a few days, the flu bug has attacked out home. I took it easy during the weekend so I am trying to muddle through today. Onward and upward right? Welcome! I am so happy that you have come to visit. I have been very busy sewing and getting ready for Fall. 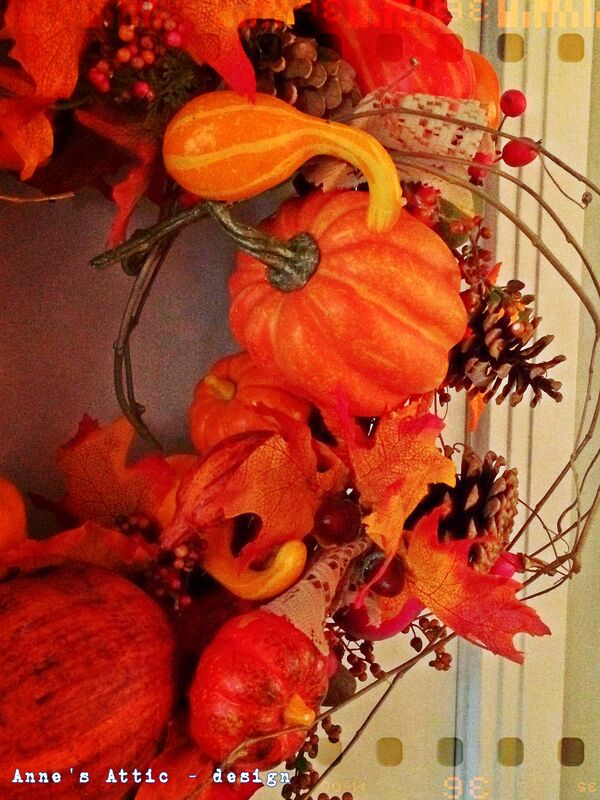 Some times I think that Fall is busier than Spring. I remember being a young mother of 4, getting the kids ready to start school, I sewed a lot of their clothes until they became to picky, gardening, canning, getting the house ready for Fall, PTA, church callings, and on and on. Does this sound familiar? I may have an empty nest, but life has not slowed down. 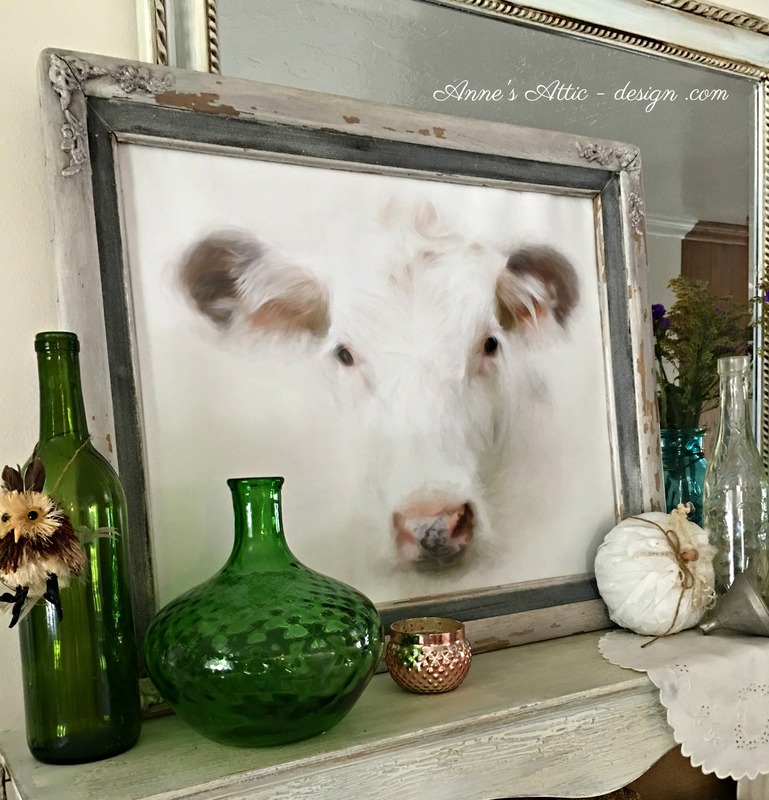 I seem to always be adding something to my list of names, see my post on To many projects. One of my many projects is making homemade vintage products for boutiques. 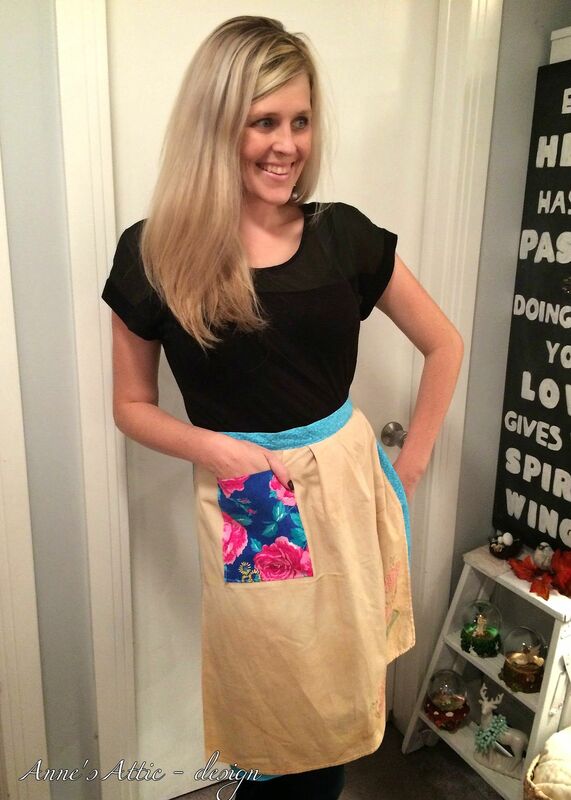 The biggest seller is my Vintage Aprons. They are easy to sew and I can produce them in large quantities without much problem. 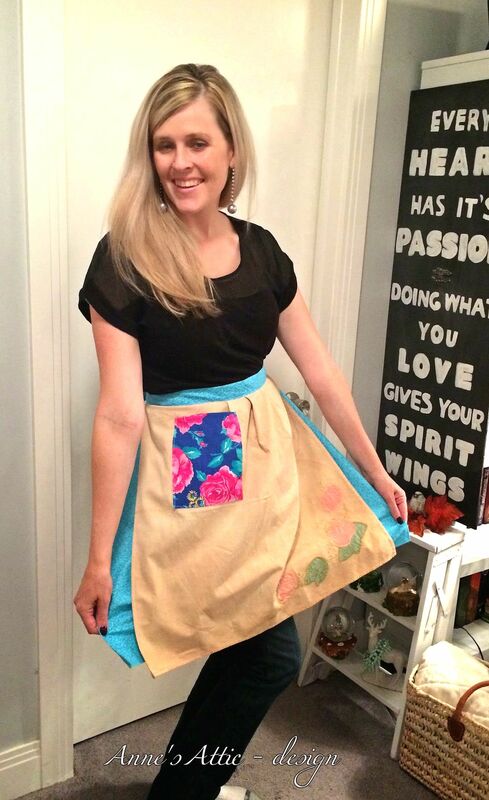 I have a beautiful daughter-in-law to help model the aprons. Thanx Jordie! Mother of the 4 children I tend. 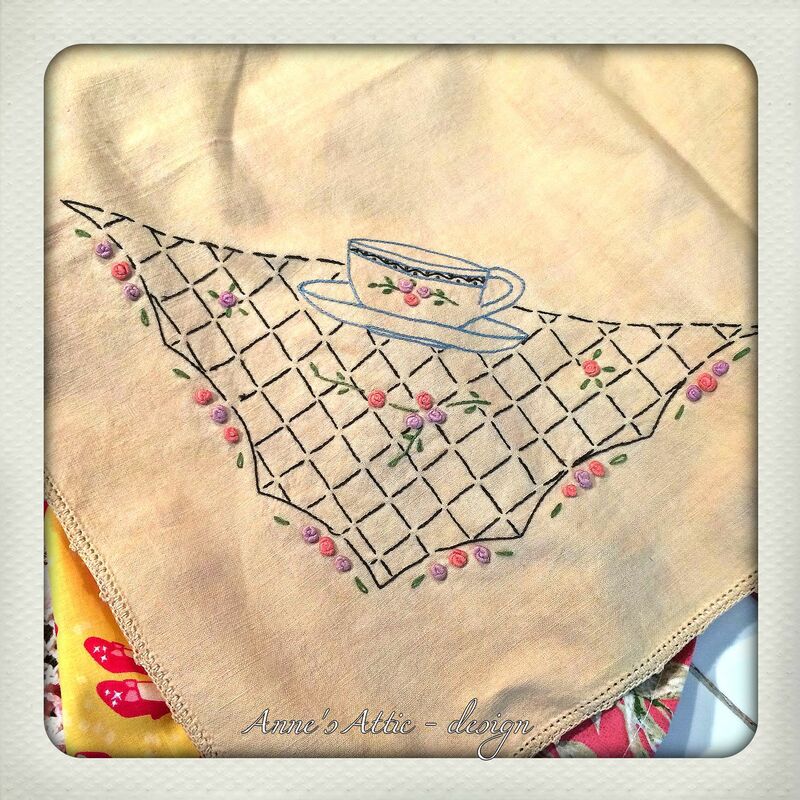 I use vintage tea towels and table cloths with embroidery on them. They are sewn to the front of the apron, between the band and the apron parts. It’s like having a dish towel attached to your apron. 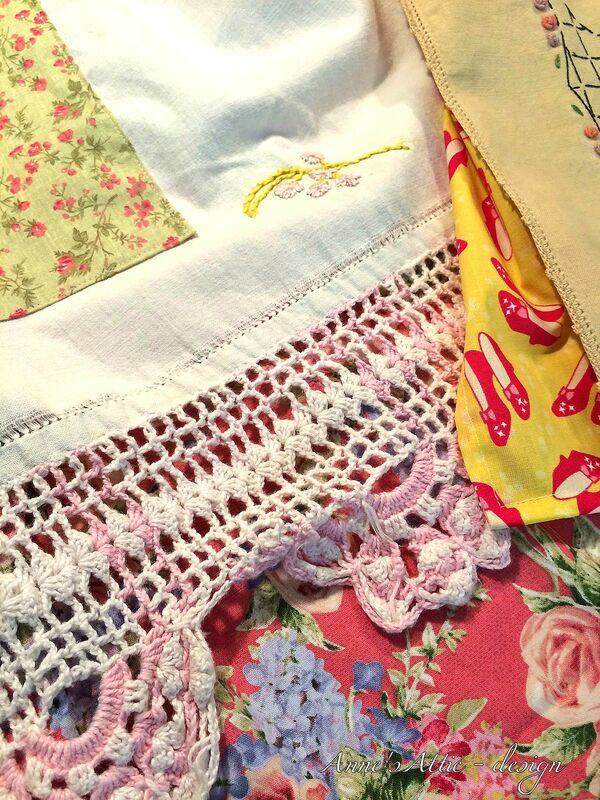 Many times I can find vintage calico fabric for the aprons. Look at the lovely stitching on this lovely towel. This towel has beautiful crocheting around it, I almost don’t want to use these lovely aprons because of the vintage stitching. Love, love it. The time that has gone into the stitching I so appreciate, I sure wish I knew who made these pieces. 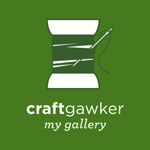 If you are not FOLLOWING my blog I would love that you would. 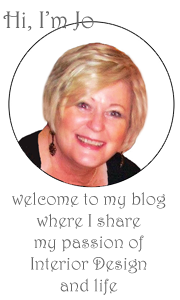 Please follow me on Facebook, Twitter, Hometalk, bloglov’n. Thank so much! If by any way that you are interested in one of these gems, email me. I hope that you have a beautiful Fall week, and enjoy life because you are doing what you love. I love it when you leave a comment!